The kangaroo is a mammal. It is a marsupial. This means it carries its baby in a pouch. Kangaroos and other marsupials such as the koala, the Tasmanian devil, and the opossum live in Australia and the New World. Kangaroos are the largest living marsupials from the family Macropodidae. There are four species: the red kangaroo, the eastern grey kangaroo, the western grey kangaroo, and the antilopine kangaroo. Fossil remains of about 30 different kangaroo species have been discovered in Australia. One is a giant type that probably stood 10 feet (3 meters) tall. Kangaroos have powerful hind legs, a long, strong tail, and small front legs. They are the largest of all marsupials. They stand over 6 feet (2 meters) tall. Thanks to their large feet, kangaroos can leap some 30 feet in a single bound, and travel more than 30 mph (48 kmh). Kangaroos use their strong tails for balance while jumping. If threatened, kangaroos pound the ground with their strong feet as a warning. Fighting kangaroos kick opponents, and sometimes bite. Kangaroos live in the forests, woodlands, grassy plains, and savannas of Australia, surrounding islands, and Tasmania. They number in the millions. Kangaroos eat grasses. They are plant-eating grazers. This means they stand in one place to eat all the plants they can reach. They can live for a long time without water. Kangaroos live and travel in groups called mobs, troops, or courts. These groups are dominated by the largest male. Male kangaroos are called boomers, bucks or jacks; females are does, flyers, or jills, and the babies and young ones are called joeys. Kangaroos are the only large animals to use hopping as a means of traveling. Because of its long feet, a kangaroo cannot walk normally. To move at slow speeds, a kangaroo will use its tail to form a tripod with its two forelimbs. It then raises its hind feet forward, in a form of locomotion called "crawl-walking." 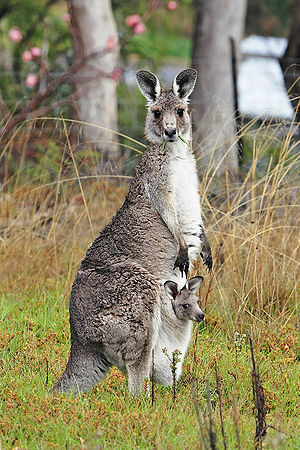 Female kangaroos usually give birth to one joey at a time. Newborns weigh about 0.03 ounces at birth - as small as a grape. They are about an inch long. After birth, the joey crawls into its mother's pouch. Here, it will nurse, and continue to grow and develop. Joeys leave the pouch between 8 and 12 months. Besides humans and wild dogs called dingoes, kangaroos face few natural predators. Heat, drought, and hunger due to loss of habitat are the biggest dangers kangaroos face. This page was last edited on 21 June 2014, at 21:17.